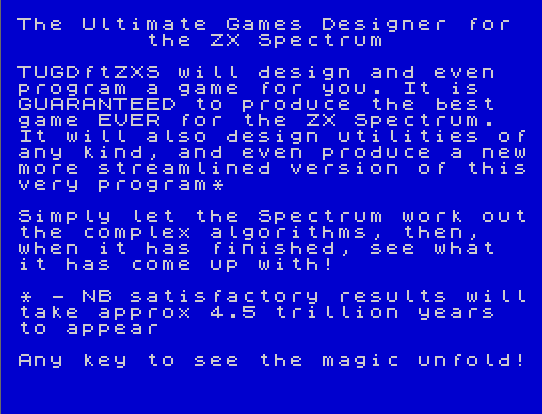 The question is; is this as ‘ultimate’ as Andrew’s previous Ultimate ZX Spectrum Games Designer? 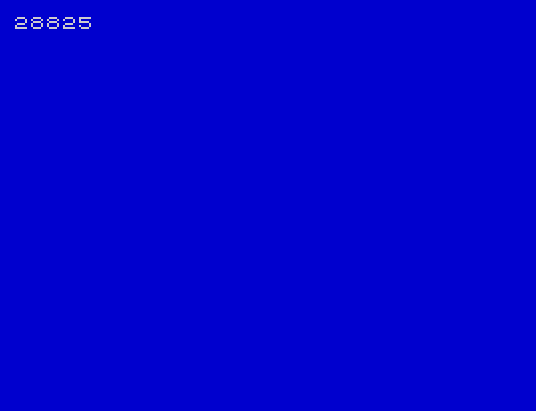 I got one C Nonsense in BASIC as well having sat through three sequential 22.5 minute iterations of this program. Imagine my surprise on attempt #3, however, when the program spat out a fully functional copy of Renegade III!? Amazing! Heh not quite, UZXSGS has at least some chance of producing a viable game before the moon explodes. Oh that is inspired (despite the flaws!). I’ve just tried a similar version in assembly that uses Patrik Rak’s XOR Shift RN Generator, and it’s surprisingly difficult to do much damage, most of the code just did some ADDs & CPs then returned to BASIC, or did the old DI/Halt thing. I’ve had a pygmy marmoset typing away on my 48k since 1982 and the best it’s managed so far is a rather lacklustre version of Potty Painter. Tsk. This is exactly the type of program that Deep Thought was invented for. 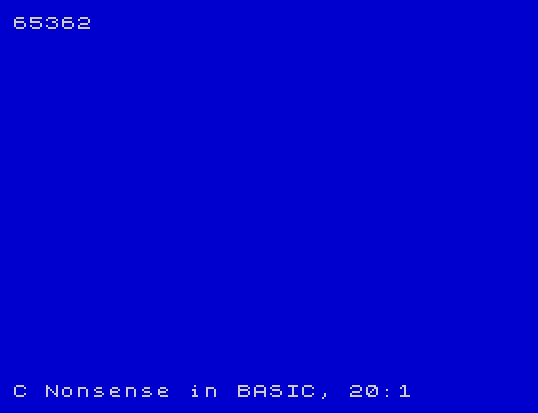 And CHR$ 42 is the asterisk – the most sprite like of the speccy font. If my maths is right the odds of randomly getting this (not using Andrew’s program!) are 1 in 4294967296, if we say any UDG it’s better – 1 in 204522252.2. I wonder if it’s possible to create a program that starts with a simple bit of code and *evolves* it – randomly change a byte, test it, discard or follow that path if it works. Could literally result in the worlds best game.